“Hi Sarah. I just completed my last prereq for my nursing program (patho — woohoo!) and am trying to get ready for the start of my program in about 2 weeks. 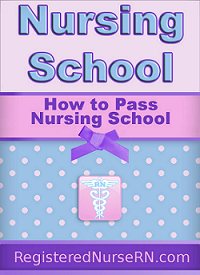 I am doing an accelerated BSN-RN 1 year program. I appreciate your comments about it being do-able because I “have my eye on the prize” and it is discouraging when I hear many of my classmates say how nervous they are; I guess I am just more excited than nervous. I am an older student with 4 young children and I am trying to figure out how to schedule my days. My first class is Health Assessment where classes and lab are 5 days/week 8-6. Any suggestions? Congratulations on accomplishing your goal – it must feel so good to be days away from graduation! Ann, thanks for your question and so so sorry about the delay. Yes, nursing school is so do-able and I like your motto on keeping your eyes on the prize. I completely agree with you about how it gets ya down when people dwell on the negatives. I think the key to passing nursing school is to keep a positive mind set and that is something I can definitely tell you have! Your schedule does sound busy. My advice is to develop a great schedule. Schedule in the time you need to do school duties and mom duties. I know that it is going to be hard on you but just remember that it isn’t going to last forever and it will be over in a couple months and you will then have a break and a new class schedule. If I were you I would break down every hour in your schedule. For example: 6pm cook dinner, 7pm kids bath, 8pm put kids to bed then study until 1000. 1000pm bed time. I know you will need more time to study so the time you are at school use your time during your breaks wisely to study. Plus on the weekends you can make up for the time you lost and spend it with your children or if you have a test coming up you can study. Overall, just keep in mind your schedule will not be like this forever and you are doing this to give yourself and your children a better life. Good luck Ann and I know one day you will be a Registered Nurse RN!